When a special moment happens, you don't want to be fussing with your camera—you want to be capturing the sights and sounds while still enjoying yourself. The COOLPIX L28 does all the thinking for you, so you can just point, shoot and rest assured the results will be great. Intuitive buttons, a large LCD display and remarkably simple menus make it easy to change modes, add Image Effects or just review your shots. And since the camera runs on regular AA batteries, power can always be close at hand. The COOLPIX L28 is so easy to use, anyone can take great photos and videos with it. Just turn the camera on, point, shoot and marvel at the results. For maximum point-and-shoot convenience, select Easy Auto Mode. It automatically optimizes the camera settings for each shot, no matter how challenging the situation. You'll be free to enjoy the moment while you capture it. Experienced photographers optimize their camera settings to match the situation. 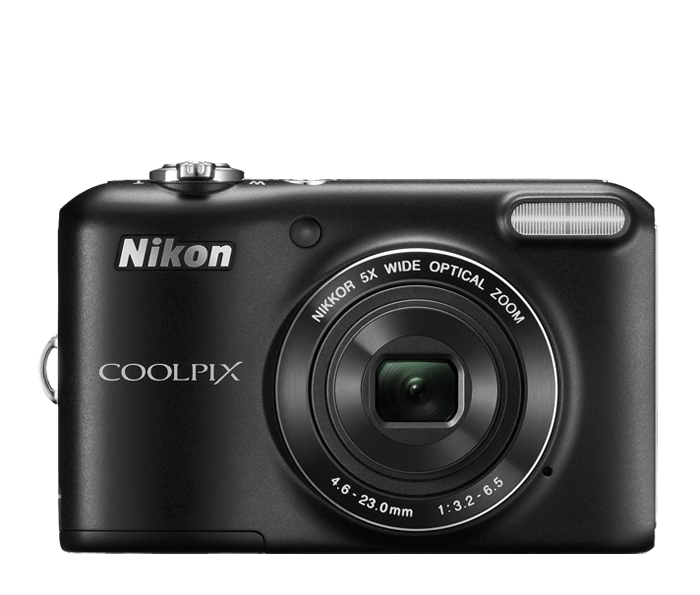 The COOLPIX L28 does that work for you. With 20 Scene Modes, including Beach, Snow, Night Portrait, Sunset and more, it's easy to match the moment to a Scene Mode. You can even get creative and use Scene Modes to alter ordinary shots. Or, select Scene Auto Selector and let the camera choose the best mode for your situation. The COOLPIX L28 high-performance NIKKOR glass lens is paired with a 20-megapixel CCD image sensor that captures bright, vibrant images. The COOLPIX L28 is powered by two regular AA batteries, which are convenient to use, and widely available. It accepts alkaline, lithium and Nikon rechargeable batteries, available as an optional accessory.